Back in the mid-1990s, Sig Hutchinson got a new mountain bike. He lived along Falls Lake and knew there were some good trails in the area. What he soon discovered was that they were hiking-only trails — the MST. So Sig set out to see about getting some mountain bike trails into the local mix. The short-term result of that push was the New Light mountain bike network on the north shore of Falls Lake. 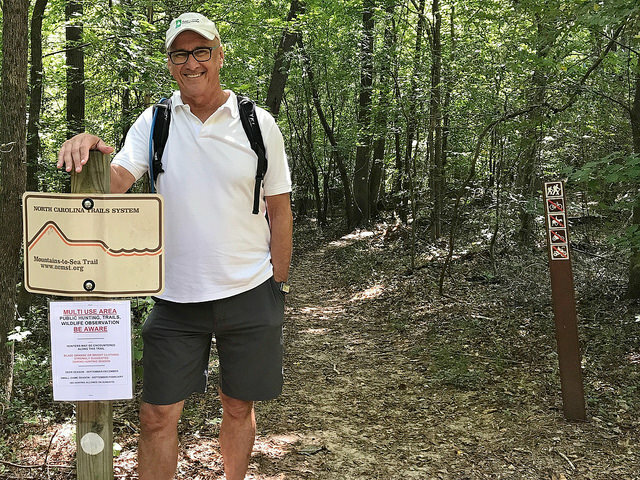 Sig didn’t quit there: for more than two decades, Sig has become the Triangle’s leading advocate for trails and preserving greenspace. Currently, he is the chairman of the Wake County Board of Commissioners, and his advocacy for the natural world is as strong as ever. It was an honor — though certainly not a surprise — to have him on the trail.